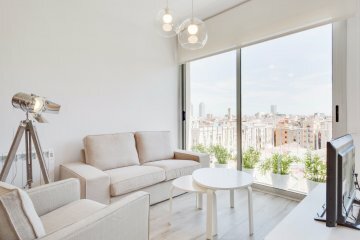 Perfect holiday apartments for rent in Barcelona for a family or group of friends, spacious, fully equipped and with a large and sunny quiet balcony. Stylish three double bedroom, one with queen size bed and access to the sunny balcony. The second double bedroom with queen size bed is just in front of that one and both share one of the full bathroom. The third bedroom has twin beds and a separated full bathroom. 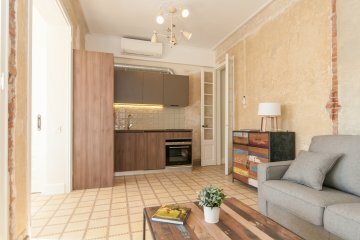 The living area consists of a cosy living room with a convertible double sofa bed, flat screen TV with international channels, and access to the sunny and furnished balcony. Gorgeous opened modern kitchen fully equipped with dishwasher, oven and any cooking facilities needed and design style dinning area with large table for eight people. Additional services in the apartment include wifi, air conditioning in all the apartment and safe box. There are five different apartments in this same category, one on each floor. 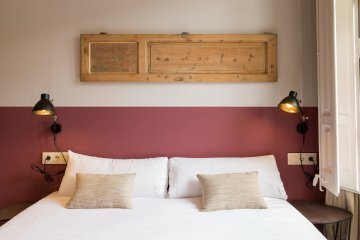 These apartments in Barcelona center are available for monthly rentals and price includes utilities and a weekly cleaning.